This quiet condo is located across the street from the Park City Resort’s parking lot and as close to ski in ski out as you can get without pay high resort rates. You are 10 min walk or a 3 minute free bus ride to Main St. The condo was remodeled with an all stainless steel kitchen with granite counter tops. The living room was redone with a nice gas fireplace and rock mantle. The condo complex has a great hot tub and a warm (even in winter) swimming pool. The master bedroom has a queen bed and the 2nd bedroom has two twin beds. The sofa folds out into a double bed. There is a 40” tv above the fireplace and a 30” tv in the master bedroom. The tv in the 2nd bedroom just plays DVDs. The complex has free wifi. I have owned the condo since 2000 and have been a part of VRBO since 2001. My reviews are older because I had the condo rented for all of 2017 until October. Our adults family of four stayed for a week of skiing. Close to lifts plenty of room quiet with parking available. Would stay again. Flew in for a conference and skiing with family. Location was perfect. Was great there was a key code to the door because when we separated we didn’t have to worry about who had a key. Property very nice. My son had a friend so they stayed in guest room and my daughter comfortable on pull out couch. We were Notified the day before one toilet not working properly but by the time we arrived was fixed. Would definitely stay again ! We have enjoyed ski trips out west, the northeast, and Europe. It was the first time for all four of us to ski Park City together. Wayne's 2 BR and 2 Bath condo at Edelweiss fit the bill. 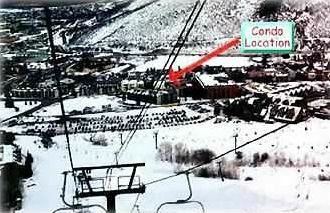 Key considerations for us were access to ski lift -- a 5 to 10 minute walk across a parking lot to access the lifts (could also have taken shuttle right in front of unit), location (close to lift and downtown Park City), price and comfort. This condo delivered on all fronts and helped make our stay a wonderful vacation. Leaving the condo, we would be on the lift within 10 minutes of leaving the unit, we could then take lifts to the peaks at Park City, the gondola over to Canyons and ski all 7000 acres of the combined resort. We avoided green runs, hit many blues and black and double blacks, averaging about 30,000 - 40,000 feet of vertical per day. If this is the type of terrain and aggressive skiing you are looking for, Park City would be a bulls eye for you. In my opinion, the starting point gave you great and easy access to the entire resort -- Park City and Canyons. There are multiple restaurants, ski rental shops, coffee shops and other amenities within immediate walking distance (5-10 mins) of the condo and Park City/Old Town was a short bus ride away (5-10 mins and the buses come several times per hour). We actually walked back from main street/restaurant strip to the condo multiple times (about 10-15 blocks which took about 20-25 minutes). We did not spend a ton of time in the unit as we were skiing 6-7 hours a day and then headed into town once we could feel our legs again. The unit was remodeled (newer appliances, granite countertop on kitchen, very nice cabinets, etc.) and clean, and made a very nice initial and final impression. It is a garden unit with windows and incoming light but obviously no mountain views. To be clear, these accommodations are not ultraluxe, but you are also not paying anywhere near $1500 - $3000 per night. In retrospect, one of the truly reassuring aspects of the stay was dealing with the owner, Wayne, who was helpful, cooperative, attentive and very responsive. I highly recommend a trip to Park City and a stay at Wayne's unit at Edelweiss. All the best! Walking to ski rental and the lift along with the bus stop right out the front door to get to Main Street or Deer Valley made this an ideal condo for our family. Wayne was very helpful with details and the condo was exactly as advertised. So grateful we could spread out and not be in a hotel. The Jacuzzi and pool were heated and a nice bonus. All rates are negotiable. Lower rates for last minute reservations.